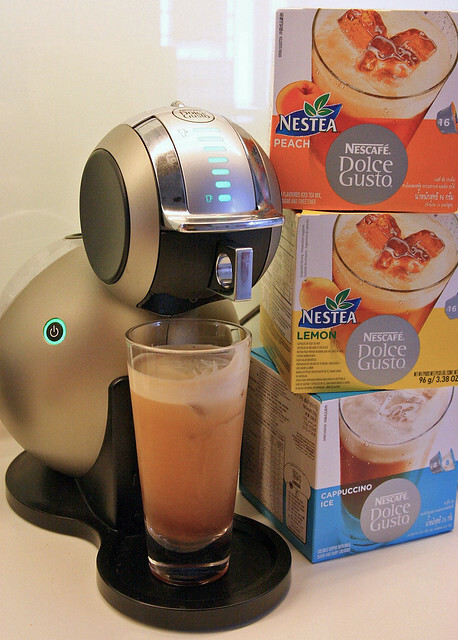 I've been road-testing the NESCAFÉ Dolce Gusto Melody Automatic for a few months now, and am quite addicted to the pop-a-capsule convenience. The best part is - I don't have to wait too long for it to heat up (unlike with some machines). Coffee comes out richly fragrant and faster than you can get an order at Starbucks. The 15-bar pump pressure also creates that coveted golden crema on top of your coffee. 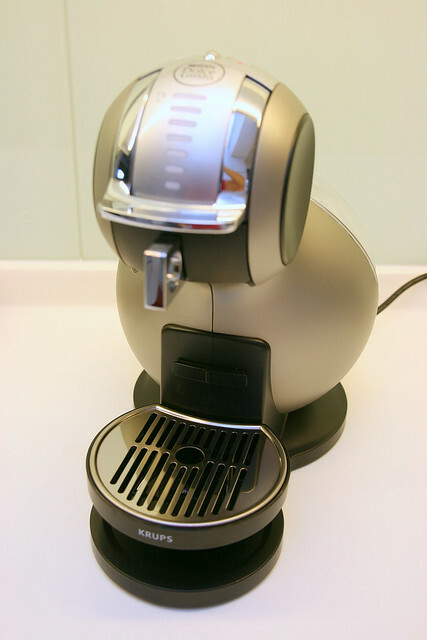 Of course, this is not going to give you the same espressos produced by professional $5,000 coffee machines at cafes, but it's more than decent for home use, and at just a fraction of the cost (less than a dollar per cup for most flavours). There are also some new coffee flavours introduced earlier this year along with the machine. "First and only capsule product that offers coffee with frothy milk in one single capsule for the added convenience"
YES! One capsule does it all. Some milky drinks previously needed two separate capsules, and this also meant you got only half the serving of drinks (8 per box) because they can only pack 16 capsules per box. Now with this, you have 16 full servings per box. I still need to add more milk for this cafe au lait though. "Short black coffee (50ml) with an extra strong intensity – 8 on the strength scale of Espresso range for the perfect perk-me-up or after meal cup"
Oh this is potent! The strongest of the three, this one really impressed with its wonderful aroma and caffeine kick. "Intense and bold, take long slow slips for a longer enjoyment of this long black coffee (180ml)"
I like this one for regular coffee. It's also not too heavily caffeinated, so I can still sleep immediately afterwards. I have been buying this the most. The machine also makes tea! Iced teas and coffees, in fact. Pop a capsule in and let the drink cascade into a glass of ice - voila. Something to beat the heat with. Personally, I prefer the coffees best. And I confess, I like the quick heating feature so much, sometimes I use this as my hot water dispenser (no capsules in the tray). The heat is just perfect for my green tea. And it's great that the machine can hold a good amount of water, so you don't have to keep topping up (had that issue with a smaller machine). 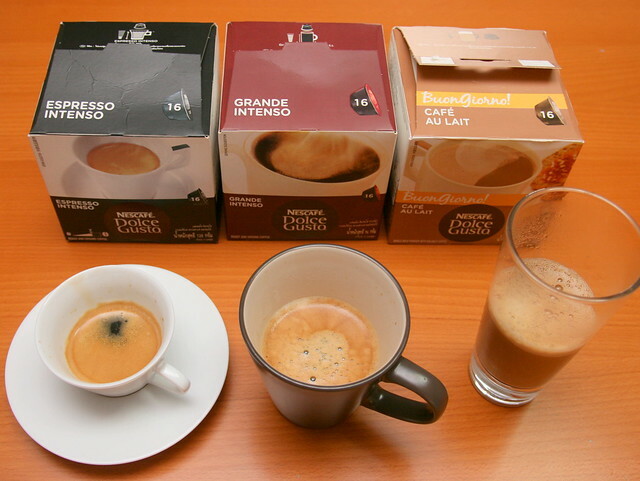 Form factor wise, I like the MELODY the best, out of all the Dolce Gusto machines. It's the curves, the functionality, and it looks really cute on the countertop too. This is the Titanium model, it's also available in a nice bright red. Well, there can't be a better time to get the Dolce Gusto MELODY Automatic; it is now selling at S$249 (usual S$279) and comes with a free starter pack. Plus, Christmas is coming. Check out the website for more details and stockist info. Many thanks to NESCAFÉ for the sponsoring the machine and coffee/tea samples. The capsules are available at most supermarkets - you can try Cold Storage at Bugis. Most boxes are about S$10.90. okay then i will try to look at Cold Storage.. thank you Camemberu :) have a nice day.